This is the building I'm referring too. That's Hagrid's Agway Edifice of Nonmagical Horticultural Implements. Huzzah! That's pretty bad, even worse is the fact that you are angled toward it. I suppose there's still time for them to slap a facade over it. so it really may not be that noticeable as you zip by. In the aerial testing video you can see the train is going slow enough to notice the building, you're also angled toward it. If they don't slap a facade on it or hide it better, it's kind of inexcusably lazy. For a project of this scope, that would cost pennies. I’m bothered by being able to see random buildings when the doors open at the top of Tower of Terror, it ruins the entire theme of the ride. And being able to see non Disney properties far off in the distance while going up the lift hill on Expedition: Everest. And I loose sleep over being able to see Frontierland from the queue of Haunted Mansion. Typical “but Disney!!!111! !” response from you, bravo. Wouldn’t expect anything different. Seeing structures that aren’t part of what you’re riding isn’t the same as leaving a bunch of unthemed or very lazily masked infrastructure IN THE RIDE AREA. I mean if you want a more apt comparison, the fact that you can see into the structure on Everest during the backwards helix despite that Disney could easily hide it with a tarp to cover the gap is a much more comparable example. But Disney taking lazy shortcuts does not excuse criticism of Universal for also doing so. Good lord dude we get it. You're mad because you might see some buildings. Dropping ride and show control rooms into the middle of an attraction is just bad show. Flat out. It is exactly the sort of dropping of the ball that has become par the course for Universal Creative when left on their own. If the tradeoff between getting the awesome attraction we're getting now, or some cut down version to move budget to reorient/heavily theme that structure is a possible momentary glimpse at a ride structure, I'll take it every day and twice on Sundays. I can't see it being that huge of a deal, really. You say you'll be "angled towards it," but your sight isn't being directed towards it, the top of your head is. You're just being rolled to the side, and you'll actually have a harder time seeing it through the turn because of the banking than if it were just a flat curve. On launches your vision is generally pretty tunnel-like, even on less intense ones, in my experience and observation. Unless I'm purposely looking to the side, my natural reaction is to focus entirely straight ahead once the launch is happening. Cool, great. We get it. Every freaking new aerial picture that gets posted you come in to whine and moan about something. We get it. This isn't the only shortcut we can see though. I also don't understand why there has to be some sort of tradeoff, as if properly theming visible structures is going to tank the project or something. Univesral is more than capable, both from a financially and creatively, of designing something fully cohesive and immersive, on par with, say, Radiator Springs Racers or Big Grizzly Mountain. This ride doesn't also have that much going for it in terms of thrills. It is indeed very much about the visuals you experience while on the ride. Seeing backstage and infrastructure on Hulk, for example, doesn't bother me because it's not an immersive attraction at all and is entirely about the thrills and intensity. 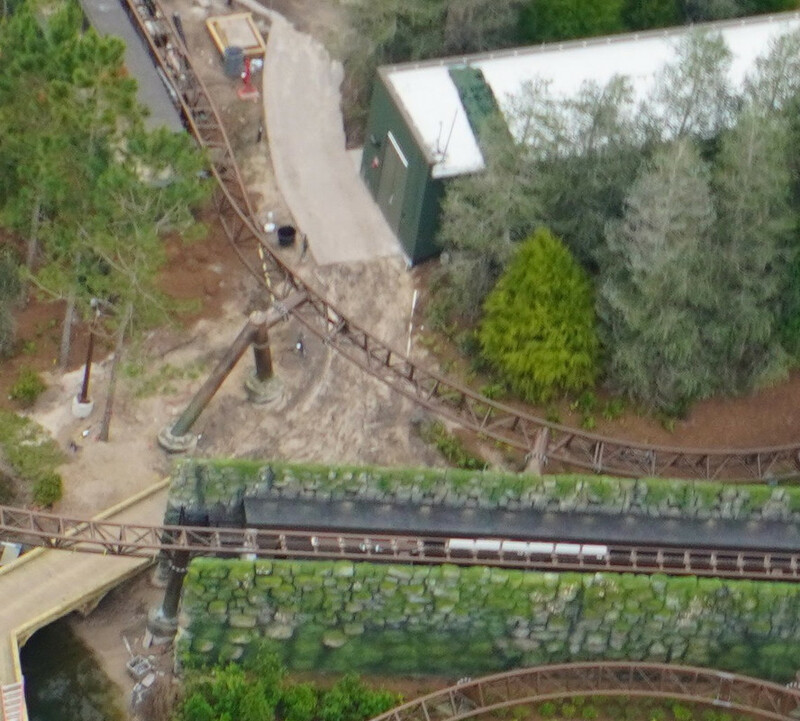 (though they really could have put a wall up in the transfer track section to hide backstage during the refurb/rebuild...). There is still 2 MONTHS until this attraction opens. Trees can be installed in an hour. Let it open before ripping it apart. That’s all. You don’t plant trees in hardscape. People have been complaining over and over about the constant screen-based rides that keep getting added to Universal Parks. Now that a non screen-based ride is about to open...they complain even more. Honestly if they hate Universal so much, don’t go. That was an example. They are still working on theming, landscaping and other scenic elements along the ride. A lot can happen in 2 months. They are by no means finished with everything. Screens have nothing to do with this. It’s a lousy example. Two months won’t move buildings or change how they were constructed. I could be wrong but I don't think two months is enough to properly theme the building, either. It seems pretty apparent that green paint is their solution. It is great that this isn't a screen ride. What's not so great is that they seem to not be living up to their past efforts. You don't see things like this on Jurassic Park and you didn't see them on Jaws. What's not so great is that they seem to not be living up to their past efforts. You don't see things like this on Jurassic Park and you didn't see them on Jaws. It’s not even living up to the beautiful ruins, a building that is supposed to look like it is falling apart.